Use this decision tool to estimate returns to a landowner and tenant under different rental agreements, including cash rent, flexible rent, crop-share, or a custom farming agreement. More than half of Iowa’s farmland is rented to tenant operators. In parts of central and northern Iowa half to two-thirds of the land is tenant-operated. On the other hand, in south central and southeast Iowa, less than one-half of the land is farmed by a tenant. The trend over the past several decades has been for more of Iowa’s farmland to be leased rather than operated by its owners. In many cases, retired farmers or their heirs wish to continue to own farms, but do not want to operate them. Farmers with limited capital also find that they can more easily reach an efficient scale of operation by renting rather than owning. Leasing farmland involves a business agreement between the owner and the operator. A farm lease is a legal instrument that describes that agreement. The lease provides the basis for combining the landlord’s and the tenant’s resources of land, labor, capital, and management to efficiently produce farm commodities. Variations in leasing arrangements occur because of the differences in the productive capacity of the land and improvements, the contributions made by each party, and the personal goals of the tenant and owner. Rental terms need to be revised periodically to keep them up to date. The lease agreement also protects the legal rights of all parties involved. Land is an expensive resource. A large capital investment is required to purchase enough land to provide the farm family an opportunity to earn a satisfactory living. A typical full-time farmer in Iowa today operates more than 800 acres. The average value of Iowa farmland is over $7,000 per acre. Therefore, the land investment for a commercial farm today can easily near $6 million. Many farm families cannot afford to purchase farmland because they do not have enough capital for a down payment, or the income will not be sufficient to meet the financing payments. Young families often have labor, some operating capital, machinery and management ability that they wish to use in a farm business to produce income for living expenses and future investment or debt reduction. If they are not in a position to purchase land, they can rent land and build equity for a potential future purchase. A common method is to operate a combination of owned and rented land. This allows the operator to have a home base with machinery and grain storage while leasing additional acres. Many individuals or institutions that own land are looking for someone to farm it to provide a return on their investment as well as maintain its productivity. Land ownership can also provide a hedge against inflation through appreciation in land values over time. Many landowners are former farm operators who have retired and who wish to retain their investment in the land for security, retirement income, income tax deferral, and sentimental reasons. The four most common types of leases used in Iowa are the fixed cash lease, the flexible cash lease, the crop share lease, and the custom farming contract. The common terms of these leases are described below. Under a fixed cash lease the tenant pays a given amount of cash rent per acre per year for the use of the farm resources. The landlord may put some restrictions on what crops can be grown, or what tillage, conservation and pest control practices can be used. Other than this, the tenant has a free rein in planning the crop and livestock production program on the farm unit, and receives all the crop and any associated USDA commodity program payments. A variation of the fixed cash lease is a flexible lease, in which the actual rent to be paid depends on the actual yields attained and/or the selling prices available during the lease period. This ensures that the rent paid is in line with the profitability of the crops grown that year. Sometimes government payments and crop insurance benefits are also included in calculating the gross revenue. The landowner shares some of the risk of low yields or declining prices, but also shares in the extra profits when prices and/or production exceed expectations. Some flexible leases also take into account crop input costs when determining the final rent or bonus. Publication FM 1724 (AgDM C2-21), Flexible Farm Lease Agreements has more details. The distinguishing characteristic of a crop share lease is that the owner receives a share of the crop and USDA payments as a return for the land resources used. In Iowa, a typical division for corn and soybeans is for the landlord to receive one-half of the grain. A variation is a 50-50 crop share lease with a small cash payment to offset some of the seed technology fees or reduced tillage. In other regions where farmland values are lower, the owner may receive only 25 or 30 percent of the crop. The owner’s share of a hay crop varies, depending on how the costs for establishing the seeding were shared. In some cases, the tenant pays a cash rent for land in pasture or hay. There may be a separate rental charge for a good set of buildings or grain storage facilities. The owner normally furnishes land and buildings and pays half of the costs of inputs such as fertilizer, seed, and pesticides when the crop is divided 50-50. Owners are usually responsible for drying, storing, and marketing their share of the crop, as well. The tenant usually furnishes all the labor, fuel, equipment, and the other half of the shared expenses. Many variations on sharing of expenses exist, however. Publications FM 1811 (AgDM C2-15), Survey of Iowa Farm Leasing Practices and AgDM C2-30, Crop Share Leasing Provisions, provide more details about the sharing of expenses under a crop share lease. AgDM Decision Tool C2-30, Crop Share Lease Analysis, calculates input contributions from an owner and tenant to determine how profits can be split equitably. Under a custom farming contract the operator supplies all the labor and equipment needed to perform tillage, planting, pest control, harvesting and moving of crops to storage. The landowner pays all other expenses, and receives all the crop and any USDA payments. The custom operator receives a fixed payment per acre from the owner, or a fixed payment for each operation performed. Some agreements pay the custom operator a bonus for meeting certain planting date or yield goals. Others provide for the operator to receive a percentage of the crop instead of a cash payment, generally from 20 to 25 percent. This is sometimes referred to as a “net share lease.” If the custom operator takes responsibility for purchasing and delivering crop inputs, the cash payment or share of the crop is generally higher. Publication FM 1823 (AgDM A3-15), Custom Farming: an Alternative to Leasing has more details. All types of leases have advantages and disadvantages to each party. The tenant and owner should consider them before choosing the type of lease and the terms that should be incorporated in it. The lease is simple with relatively few chances for misunderstanding. The owner is relieved of making day-to-day operating decisions. The owner has very little financial risk. The tenant has maximum freedom in planning and developing the cropping and livestock programs. The tenant has fewer records to keep when multiple landlords are involved. A fair cash rental rate may have to be renegotiated each year. Cash rents are likely to be too low in times of rising prices and increasing yields, and too high in times of low prices or low yields. Selling prices and production costs may be higher or lower than anticipated when the rental rate is set. Tenants are required to supply more operating capital. Tenants bear all the risk of production shortfalls. The amount of rent to pay increases or decreases automatically from year-to-year as prices and yields change. The need for the owner and tenant to renegotiate the rental rate each year is significantly reduced. Both parties must agree on a formula for setting the cash rent each year or every few years. Both parties must agree on how to determine the prices and yields to include in the formula. There is uncertainty about how much the tenant will pay and the owner will receive each year. Risks associated with price and yield variations are shared. The owner is more involved in making decisions and marketing the grain during the year. Both parties share the benefits from adoption of yield-increasing technology, or unexpected high yields or prices. The owner receives more information about yields and inputs used each year. A second USDA payment limit is created. The landlord and tenant must agree on how production expenses will be shared. Adjustments for sharing costs for storage and drying facilities, herbicides that reduce field work, or fertilizer and pesticide application may have to be made. The cropping plan to be followed and whether or not the farm participates in government programs must be agreed on. Added cash rent for the use of buildings and storage facilities may have to be negotiated. If the owner’s and tenant’s grain is stored in the same bin, marketing decisions have to be made jointly. The landowner may be considered a material participant, and farm income may be subject to self-employment taxation. There is very little financial risk for the operator. The owner benefits from any unexpected high prices, yields or government program payments. Only one party is responsible for marketing grain and making production decisions. Agreements are usually fairly simple to negotiate. The owner bears all the risk of low yields or prices, or high input costs. The number and timing of field operations to be done each year may have to be modified, depending on weather conditions. The operator has to set priorities among the custom farmed land and other rented or owned land. The owner must communicate to the custom operator the cropping system, fertility program, and type of pest control to be used. Crop inputs such as seed, fertilizer and pesticides must be purchased and delivered in a timely manner. The landowner may be considered a material participant, and farm income could be subject to self employment taxation. AgDM Decision Tool C2-01, Estimated Returns by Farm Lease Arrangement, can be used to estimate returns to a landowner and tenant under different rental agreements, including cash rent, flexible rent, crop share, or a custom farming agreement. 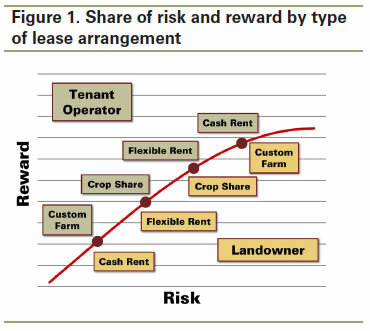 Figure 1 depicts the share of risk for tenants and landowners depending on the type of lease arrangement. There are certain key areas in developing a farm lease that should be given very careful consideration by both parties. The answers to these questions will depend on the intent of the parties in the leasing arrangement and the bargaining position of each. A question that frequently comes up is the landlord’s responsibility in sharing herbicide costs for weed control that may be a partial or complete substitute for cultivation or other tillage methods. Most landlords agree to furnish half of the cost of these materials under a crop share lease. Some feel that where no-till or minimum tillage practices are used they should not have to pay a full 50 percent of the cost of herbicides. See publication FM 1811 (AgDM C2-15), Survey of Iowa Farm Leasing Practices for more information. There are many variations in how the costs for custom application of fertilizer and pesticides are divided. Therefore, it is advisable to discuss these items in advance and state in the lease whether or not the landlord will share in any of these costs. How will costs associated with combining, drying, transporting, and storing crops be shared under a share lease? When the corn drying facilities are part of the rental unit, the landlord often furnishes the dryer and storage facilities. If the corn drying unit is portable it may be jointly owned, or either party may own it and charge the other party an established amount for its use. The fuel and power costs for drying are normally shared in the same proportion as the crop is divided. In some cases the tenant is paid extra for delivering the owner’s share of the crop from farm storage to an elevator or processor. Under Iowa law a farm tenant has the right to remove stover (stalks, leaves, cobs) left in a field after harvesting unless the lease states otherwise. Stover can be used as feed or bedding, or sold off the farm. Tenants and landowners can specify a different arrangement in a written lease, or limit the amount of stover removed. See publication PM 3053A, Issues with Stover Removal on Rented Land for more information. Farm owners often worry about whether a tenant will maintain or improve the level of fertility on the farm. Regular soil testing can establish whether additional nutrients are needed. While tenants should be discouraged from “mining the soil,” applying additional fertilizer (especially phosphorus and potassium) when levels are already testing high or very high not only wastes money, it contributes to nutrient run off and downstream pollution. Applying lime to soils contributes to the productivity by adjusting the acidity of the soil. Lime applications usually last for several years. If the current tenant has operated the farm for several years, and they have contributed to the need for lime, they should pay for bringing the pH back up to a normal range. If it is a new tenant then the landlord and the tenant need to come to an agreement. The landlord might pay for the lime or the landlord and tenant might agree to prorate the cost of the lime over a 3- to 5-year period. If the tenant pays for the lime and does not rent the land for the useful life of the lime, they get a percentage of the lime expense refunded back to them. Some long-term crop share tenants may divide the cost of lime. Weed control in crops has improved considerably in recent years with the introduction of herbicide resistant seeds, though if needed, a plan against weed resistance should be discussed. Many landowners also place a high value on controlling weeds along fence rows, in ditches and around building sites. Indeed, cutting or spraying weeds classified as noxious is required by law. Iowa Code Section 314.17 (amended 2010) prohibits mowing ditches before July 15, except within 200 yards of dwellings and in certain other situations. Maintaining the appearance and functionality of farm buildings and fences is often a high priority for landowners, as well. Even if some buildings provide no substantial benefits to the tenant, they may be able to provide labor and machinery for carrying out repairs at a considerable savings to the landlord. Owners should generally pay for materials and supplies, especially if the tenant is providing labor. While such practices may have little economic payoff for a tenant, they can contribute to a longer and more harmonious leasing agreement, and often require a minimal amount of time and cost. Any additional expectations by either party should be discussed and agreed upon in writing early in the leasing negotiations. There are three ways to handle the costs of making permanent improvements to a farm property such as buildings, storage structures, conservation structures, fences, waterways, and drainage tile. The landlord provides the improvement as part of the rental agreement with an understanding that the rental rate will be increased as a result. The cost of the improvements is shared by the landlord and tenant in some form. If the improvement is constructed on the farm, the tenant may furnish labor and machinery for the job, and the owner may pay for materials. It is useful to negotiate a provision in the lease for the tenant to be reimbursed by the landlord for the undepreciated value of the improvements if the lease period ends before the useful life of the improvement is over. The entire cost of the improvements is paid by the tenant. As in Option 2, a provision for reimbursing the tenant for the undepreciated value of the investment is important. Most crop producers in Iowa participate in some of the commodity programs offered by the U.S. Department of Agriculture. They are usually designed to reduce price or production risk for major grain crops. Every few years new farm legislation is passed which requires landowners and tenants to make decisions about program participation. Under a cash rent lease the farm program benefits usually are paid to the operator, because that is the person bearing the risk. With a flexible cash lease, the commodity program payment can be included in the gross revenue used to determine the rental rate each year. Under a crop share lease the owner and tenant usually share in the program benefits in the same proportion as they share the crop. If there is a cost to participate in the program, the owner and tenant must carefully analyze the potential benefits to each party. Government program decisions can affect the rental value of a farm for several years. Conservation programs may offer short-term payments for following certain practices, as well as long-term benefits in the form of reduced erosion, increased fertility, and cleaner water. If the incentive payments do not completely offset any extra costs or reduced income to the tenant for following the conservation practices, he or she may be reluctant to participate. If the lease has only a short duration, such as one year, the long-term benefits of the practices do not offer much incentive to the tenant. The landowner may have to reduce the cash rent to offset the tenant’s short-term loss of net income. Many farm leases are in effect for only one year at a time. In fact, in Iowa oral leases cannot be valid for more than one year. However, a recent survey showed that 41 percent of cash rent leases and 68 percent of crop share agreements had been in effect between the same parties for more than 10 years. The maximum fixed term for a lease contract in Iowa is 20 years, but leases can be routinely renewed if both parties agree. Multi-year leases provide owners and operators with an incentive to invest in long-term improvements to the land and maintain soil fertility and conservation structures. They also avoid the uncertainty of building new relationships frequently. In determining whether or not a lease is fair and equitable to both parties, it is necessary to consider the lease in total rather than looking only at individual provisions or sections of the lease. One provision in the lease may be favorable to one party, while another provision may be more favorable to the other party, and the two factors may balance out. Many factors influence the terms of an individual farm lease. The productivity of the land as measured by historical yields, its corn suitability rating (CSR2) index, satellite photos, drainage maps and soil type. The value of the contributions made by each party in the leasing arrangement, such as labor, land, crop inputs, machinery or management. The bargaining position and bargaining ability of each party, and the competition for rented land in the immediate area. What has been customary in the community in the past. Family considerations that cause lease terms to vary for a relative when compared with other leases, because the owners have different income goals, want to help a child get started, or desire to keep the farm in the family. Location relative to paved roads, grain processing plants, and grain buyers. The USDA farm program crop acreage bases and proven yields assigned to a particular farm. These will affect the size of some commodity program payments that are paid to the operator and owner. Incentive payments for following certain conservation practices may also be attached to the land unit. Contracts for producing seed or other specialty crops, or to receive livestock nutrients. Access to such contracts can enhance the value of a particular property. Does the lease provide a business framework for the most profitable long-term operation of the farm? Does the agreement encourage the use of the most profitable levels of capital, labor, and management in the farm business, as well as adoption of new technology? Are the returns shared between the landlord and tenant in an equitable manner when the value of the contributions made by each party is considered? Is the level of cash rent to be paid consistent with the current land market and the productivity of this particular tract of land? Is the farming unit large enough to achieve an efficient level of operation and provide a satisfactory return to both landlord and tenant? A larger tract of land may be more attractive to potential renters than a small tract. Good communication between tenants and landowners is essential for building a successful leasing relationship. Landowners are concerned about the use and care of their farm. Nonresident owners cannot observe conditions first hand. Some spouses or children who have not been heavily involved in the management of the property may feel unsure about how to proceed with decisions. Tenants can borrow a technique from professional farm managers who provide their clients with written reports on a regular basis. Obviously, a report is more important with a crop share lease than a cash lease. It may be beneficial for a tenant with a cash lease to develop an abbreviated form of reporting, especially for landowners who have a strong interest in the productivity of the farm. Sending photos to a landowner who is not close enough to observe crop conditions regularly is a very effective communication tool. Digital camera photos or video files can be easily transmitted by email, or pictures can be printed and sent by regular mail. Some tenants are setting up password protected or invitation only websites for individual landowners to provide information such as soil maps, fertilizer tests, and yield data. For a crop share lease keep the accounting of expenses current. Most input suppliers will invoice each party individually. However, informing the owner beforehand that they will be receiving a bill, and its purpose, is recommended. Tenants renting from several owners may purchase supplies in volume and prorate the bill to each of the owners. In this situation a copy of the original invoice should be included. Explain each item on the bill, as names of farm inputs change frequently. The owner may not be familiar with commercial product terms for seed, herbicides, and insecticides, but nonetheless may have to categorize the expenses for income tax reporting. Crop insurance policies and some USDA programs require information about historical crop yields before a farm can be enrolled. Landowners need to have this information each year for making future decisions about participation in such programs. See AgDM C2-06, Farmland Lease Annual Report Form, for an example of information that could be shared between tenants and landowners in farmland leasing agreements. Written leases make the lease terms more definite and leave less chance for disagreement and misunderstanding. People tend to selectively recall only those portions of conversations that reinforce their point-of-view. It protects not only the original parties, but also assignees and heirs in case either party should die, or the farm is sold. A written lease encourages both parties to consider all aspects of the lease before the lease period begins. Decisions are made before the problems occur. In subsequent years, it provides a basis for changing provisions when conditions change. Written leases also provide documentation in case of a tax audit or for settling an estate. Lease agreements that cover more than one crop year are required to be in writing, and leases written for five years or more must be notarized and recorded at the county recorder’s office by the tenant. It should contain an accurate description of the property. It should specify a definite period for which the lease is to run. It should state the kind and amount of rent, and time and method of payment (cash lease). It should specify how production, USDA payments, and input costs are to be shared (crop share lease). Sample lease forms, with provisions for multiple types of lease agreements, are available. See publications FM 1538 (AgDM C2-12) Iowa Farm Lease Form or FM 1874 (AgDM C2-16) Iowa Cash Rent Farm Lease (short form). Several federal and state laws affect lease terms. Such legal considerations promote an efficient business, ensure that lease provisions are carried out as intended, and protect the interests of each party. It is vital to seek professional legal counsel for legal advice and considerations. A materially participating landowner must report farm income as self-employment income rather than as passive investment income. As such, it is subject to the normal self-employment tax rate. On the other hand, paying some self-employment tax will boost Social Security benefits in the future. A cash rent lease rarely qualifies a landowner as a material participant, but a crop share lease may do so. An owner must be in the trade or business of farming in order to deduct certain expenses such as interest on operating capital or applications of fertilizer and lime. Landowners who are collecting Social Security benefits and are under age 66 or 67 may have their benefits reduced if they are actively involved. This depends on the amount and timing of the income received. When landowners reach full retirement age there is no limit on the amount of active income that can be earned with respect to Social Security benefits. See the Center for Ag Law and Taxation publications for more details. Many farm properties can qualify for “special use valuation” when the estate goes through probate, which often results in a valuation below current market value. This can be advantageous for estates large enough to trigger federal estate taxes. However, one requirement for special use valuation is that the decedent or a family member must have materially participated in the business five out of eight years prior to death, and a qualified heir must materially participate for 10 years after the death of the decedent. In Iowa, a statutory (created by state law) landlord’s lien exists. The lien is applicable whether the lease is for cash rent, flexible rent, or crop share. The statutory lien is a lien "upon all crops grown upon the leased premises, and upon all other personal property of the tenant which has been used or kept thereon during the term and which is not exempt from execution," and gives the landowner preference over other security interests such as those of lenders. The UCC1 form must be filed with the Iowa Secretary of State’s office within 20 days of when the lease goes into effect to perfect the landlord’s lien. More details on legal issues affecting Iowa farm lease agreements can be found on the Center for Ag Law and Taxation website, Iowa Farm Leases: A Legal Review. A farm lease automatically continues from year to year unless either party gives a written notice of termination separate from the lease. In Iowa, a lease termination notice must be properly served in writing by September 1, prior to the end of the lease year. This applies to both cash and crop share leases, but not to custom farming agreements. A written lease may state a date earlier than September 1 for serving a termination notice. The requirement to terminate a farm lease by September 1 does not apply to tracts under 40 acres in size (in Iowa) used primarily for an animal feeding operation. However, even an oral lease is automatically renewed if it is not properly terminated in time. The termination notice must fix the termination of the tenancy to take place on the following March 1. If notice is not served, the lease continues for one crop year under the same conditions and terms. However, if mutually acceptable to all parties concerned, a lease can be terminated or modified at any time. By delivery of the notice, on or before September 1, with acceptance of service to be signed by the party to the lease or a successor of the party, receiving the notice. By serving the notice, on or before September 1, personally, or if personal service has been tried and cannot be achieved, by publication, on the same conditions, and in the same manner as is provided for the service of original notices, except that when the notice is served by publication no affidavit is required. Service by publication is completed on the day of the last publication. A form titled “Notice of Termination of Farm Tenancy” is available as AgDM C2-19. Other forms are available from attorneys. A good lease is the first step toward a satisfactory operating relationship between a landlord and a tenant. Although it is difficult to develop a lease that will provide for all possible situations, the parties should try to anticipate areas where problems could arise and include provisions in the lease to handle them. Only the parties involved can determine what is fair to each and what the final agreement should be. Many factors influence a leasing agreement, and each contract should be modified to fit the individual situation. Available at: store.extension.iastate.edu or 515-294-5247. Ag Decision Maker files are available at www.extension.iastate.edu/agdm under Whole Farm, Leasing. AgDM C2-03, Do I need a Written Lease? A series of farm lease forms and publications are available from Midwest Plan Service. 800-562-3618. Lease forms for crop land, pasture land, farm buildings and farm equipment can be downloaded at no charge.